2. 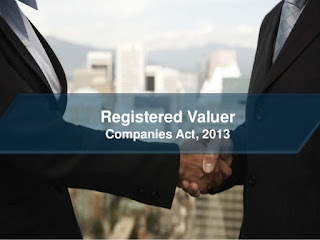 Vide notification dated 23rd October, 2017, the Central Government issued the Companies (Removal of Difficulties) Second Order, 2017 to provide that valuations required under the Companies Act, 2013 shall be undertaken by a person who, having the necessary qualifications and experience, and being a valuer member of a recognised valuer organisation (RVO), is registered as a valuer with the Authority. Vide another notification on the same date, the Central Government delegated its powers and functions under section 247 of the Companies Act, 2013 to the Insolvency and Bankruptcy Board of India (IBBI) and specified the IBBI as the Authority under the Rules. (v) has passed the valuation examination conducted by the IBBI, and (vi) is recommended by the RVO for registration as a valuer. A partnership entity or a company is also eligible for registration subject to meeting the requirements. 5. This is issued to familiarise the eligible and desirous individuals and entities with the process of registration as a valuer with the IBBI.